In what Dad says is a WORLD FIRST, but I’m not so sure, I published the Android version of Spacepants LIVE while being interviewed as a guest on the Indie Haven podcast. Yes! We finally got the Achievements working properly. And I particularly enjoyed being able to set pricing individually for ALL OF THE COUNTRIES (except China, Burma and for some reason Liechtenstein). You want Spacepants in Indonesia? That’ll cost you 20,000 IDRs. In Columbia? 3,000 COPs. Bolivia? 10 BOBs. I had three sales targets for Spacepants. Sales Target 1 was £5. 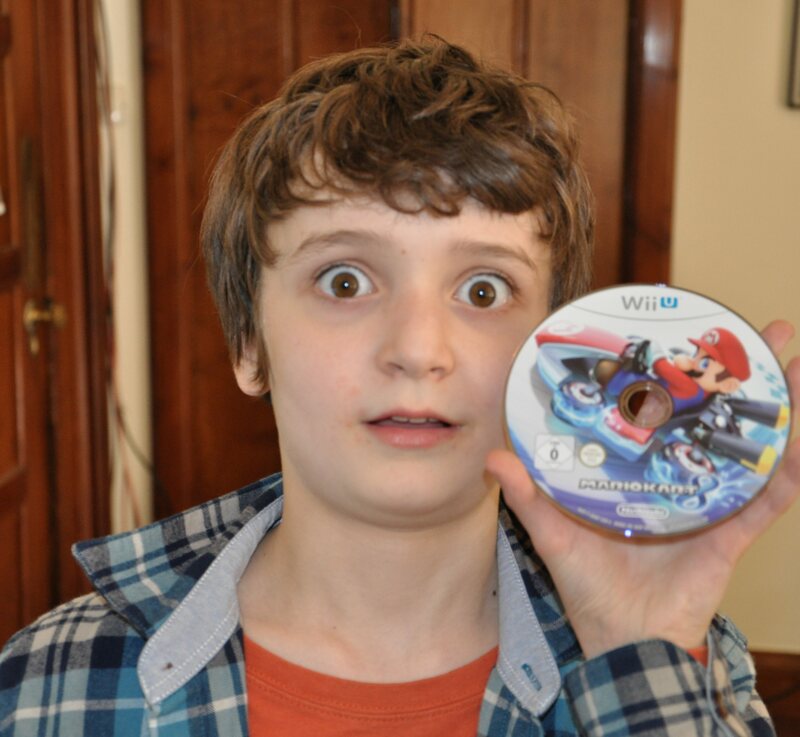 Sales Target 2 was enough to buy Mario Kart 8, and to help my brother Ben buy a PS4. This is Sam just after he’s appeared on stage for the first time in his life – sandwiched by Epic Games co-founder Mark Rein and the almighty Ian Livingstone CBE. 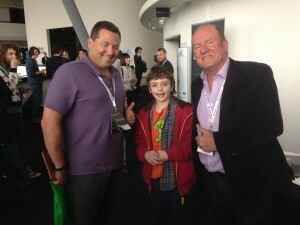 The Game Horizon conference took place in Newcastle last month, and we were there to give a presentation together about childhood, learning, nostalgia and creativity. …and ended, of course, with a big-screen Spacepants. Words of encouragement from so many people afterwards, including these two pictured legends, meant so much. As I said in the presentation, it had been three years since we took Sam out of school, and most of that time had been spent in a washing machine drum of anxieties. Talking about games, with game-makers, Sam was, finally, perfectly in his element. We remain extremely grateful to Eurogamer’s Rupert Loman for inviting us, and to everyone who helped make the day so memorable. SPACEPANTS WAS FEATURED ON THE APP STORE FRONT PAGE. After that, everything seemed to happen at once. Everyone’s tweeting me, I’m getting interview requests, I’ve even been spoken to by a Starbound developer! I’m both humbled, and totally overwhelmed by everyone’s support. You know, you. Taking the time to play my silly game, and to read this blog-thing. That’s what it all comes down to, really. It’s your support, your congratulations, and your complete “lovely-ness” that has made all this happen. So, that’s all I can say, really. Thanks. 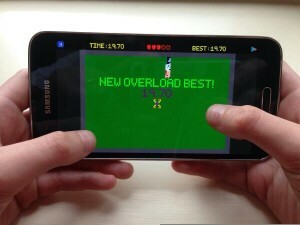 In the past few days I have begun work on an Android version of Spacepants. With Game Maker, I had a basic version running in about half an hour! The hard parts have been getting all the different potential screen sizes to look good with Spacepants’ “pixel-y” style, and dealing with Google Play setup. My Dad’s still doing the annoying bits of that. Along with the Android version, I’m going to be pushing an update to iOS with some fixes and changes to the game. -Added Sound on/off toggle in the Options menu. -Fixed an issue with menu selection. -Made changes to the way enemies spawn, to avoid an exploit. -Fixed a few graphical issues and bugs to do with dying. -Added tips to encourage Game Center/Google Play sign in (which you should totally do by the way). -Fiddled around with Game Center with help from Dad, code is a bit cleaner now. -Set up basic Google Play integration on Android devices, including icon, sign in and leaderboards. -Support for more screen sizes, along with automation in the calculation of them. 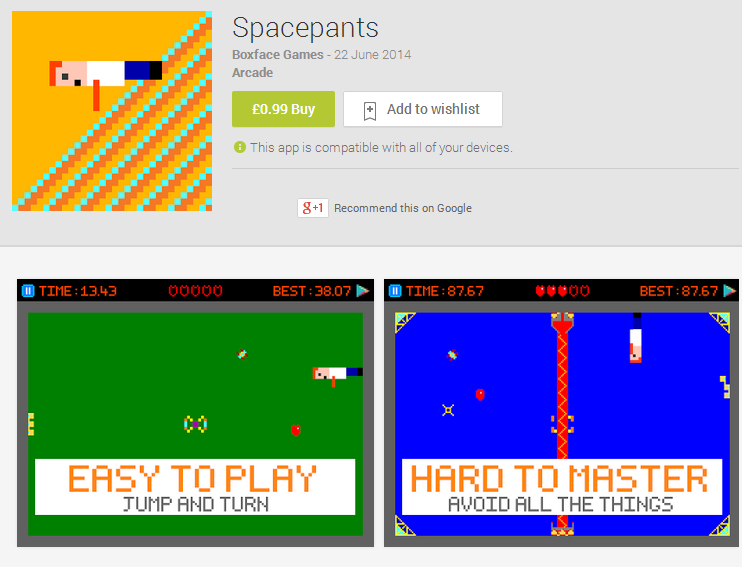 -And, of course, actually releasing Spacepants on Android. The last week has gone by pretty fast. 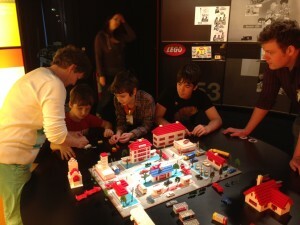 We went to LEGOLAND, spoke to the amazing MIKE BITHELL, and learned how to use TWITTER. Now, all of a sudden, I’m being interviewed, followed, and featured in The Guardian! Many thanks to everyone who’s bought the game, and everyone who’s supported me! This is me playing with the very first LEGO System bricks in the LEGO Company Idea House, along with my brothers and MIKE BITHELL. I KNOW, RIGHT? How did you make Spacepants? Spacepants was made in Game Maker. It took one month to make, and one further month to polish and get just right. Game Maker is awesome! It does a lot of the difficult stuff behind the scenes, so you can concentrate on design and content. You can start off by using simple blocks to assign event-based behaviours, then gradually discover the extra power and flexibility of GML code. The basic idea for Spacepants, a game set in a single room, with a character who can walk up walls and along the ceiling, came really easily. I did the art and animations for the player character first (Spacepants Guy, or Guy for short), and then the Space Caterpillar enemy. It was originally meant to be a Space Cat, but cats aren’t evil enough. I then spent a couple of days experimenting with controls. There were originally buttons to move clockwise or anti-clockwise, jumping if you pressed both together. Simplifying this down to a single button to turn and a single button to jump, though, made the game much easier to play. I spent a lot of time tweaking jump height and movement speeds to get the responsive feel I wanted, and had a lot of fun making and animating the other enemies. 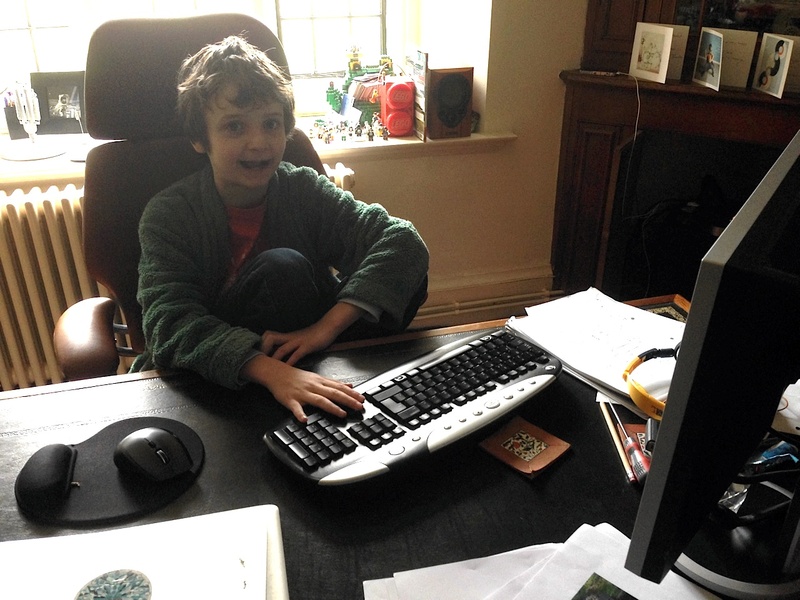 Dad helped out with some maths and bug-fixing when I got stuck. Getting the first Alpha version distributed to family and friends for testing was super-scary/exciting, and watching them play helped me to tweak the controls tutorial, which I’d always wanted to be really quick and unintrusive. Several things in the final game were stumbled upon pretty much by accident during development. The spawning/de-spawning rate of the hearts, for example, was temped in without thought but by chance turned out to be just right to match the player’s speed of movement around the room. Even though I’d really enjoyed playing the game myself throughout development, and had good feedback from a couple of Beta testers who really put the hours in on it (thanks @bennallack, @byronicman and @iainsimons! 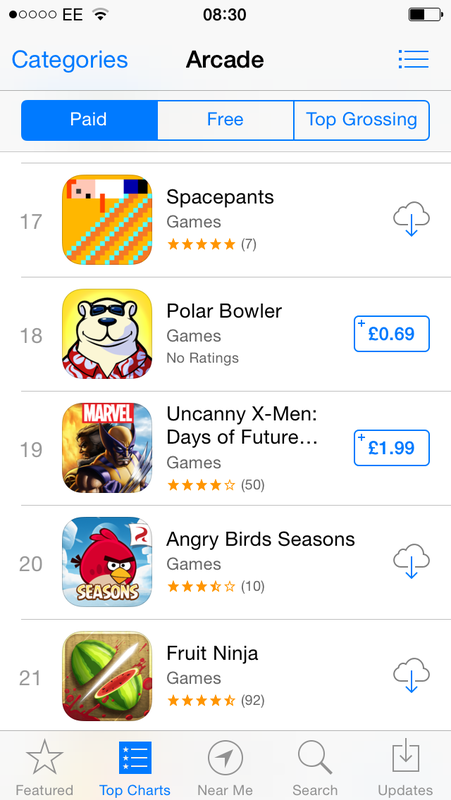 ), I was still really nervous to see how Spacepants would be received when it finally made it to the App Store. Quite a few people had suggested various changes during development which I’d ignored, because I had a really fixed idea about how the game should feel - so it’s been quite a relief to find other people who like it just the way it is!